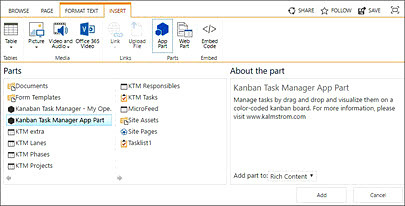 Problem App Part: How can I insert the Kanban Task Manager SharePoint Add-in App Part? When the Kanban Task Manager Add-in has been configured, the Kanban Task Manager App Part can be added to any page in the site via the App Part button under the Insert tab. 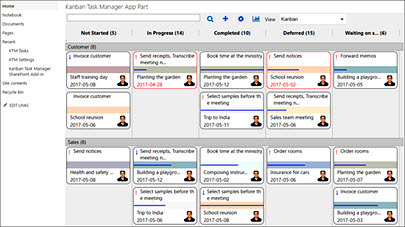 The Kanban Task Manager App Part shows the same kanban board and the same tasks as the add-in, and tasks can be created or edited in either the Add-in or the App Part. Attachments and inline images are supported in the App Part but not in the Add-in. 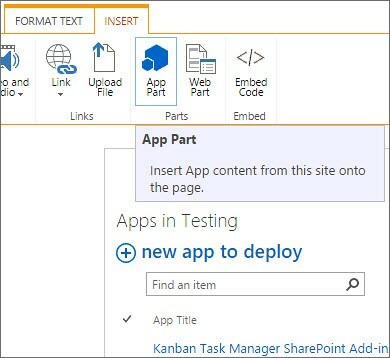 Click on ‘Edit’ on the top right of the SharePoint page where you want to add the app part. The page will open in Edit mode. Open the INSERT tab and click on ‘App Part’. Under Parts select ‘Kanban Task Manager App Part’. Move the cursor over the top right corner of the app part. 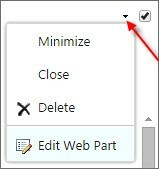 Expand the accordion and click on ‘Edit Web Part’. Expand the section ‘KTMSP App Part’ and enter the URL of the current page, where you have added the App Part. Click on ‘Apply’ and then save the page. Now the kanban board will be added to the page.